A giant, two-dimensional cupcake with cloud-like frosting lives on the back wall of a vehicle that carries its three-dimensional counterparts. The back of the Blondie’s Bake Shop truck, which features a giant cupcake graphic! 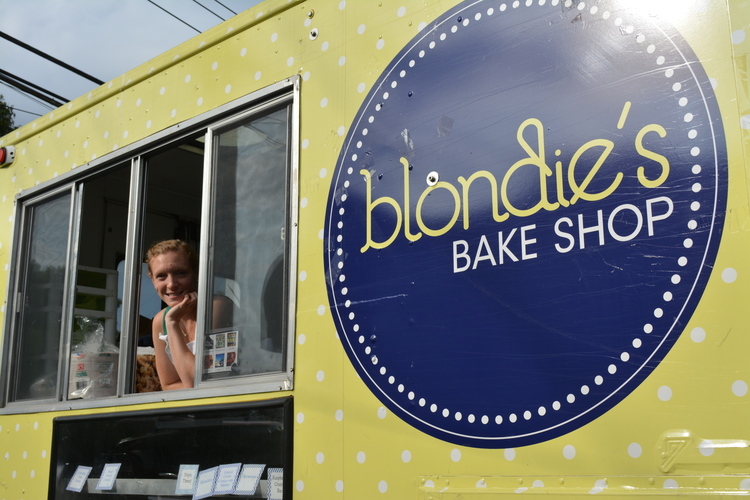 The truck, which transports cupcakes to festivals, weddings and the parking lots of a few consenting Long Island shops, was born three years ago of Blondie’s Bake Shop owner Jess Kennaugh’s desire to get into the bakery business. Jess Kennaugh made her “cupcake truck” in New Jersey almost three years ago. She designed the truck and had it made in New Jersey, and then, “sort of accidentally simultaneously,” found the bakery’s current storefront. “It wasn’t the original plan to do both at the same time, but that is what happened,” said Kennaugh, who worked for A Rise Above Bake Shop in Huntington village for 13 years – through high school, college and beyond. And so, three or four days a week – so long as Kennaugh can staff both the shop and the truck – the truck traverses the island’s roads. Depending on its destination, the truck’s contents vary. There are always cupcakes, Kennaugh said, and the rest of the menu changes based on time of day and other vendors that will be at events. Blondie’s Bake Shop offers cupcakes and other treats like cookies and brownies. There are also gluten-free options. For a morning stop, she will bring breakfast; later in the day, she will bring such options as chicken and waffles, made-to-order grilled cheese sandwiches and the grilled macaroni and cheese sandwich. Lately, Kennaugh said, the truck has seen an increasing number of weddings. “Where maybe photo booths were ‘the thing’ for a little while, I think that food trucks at your wedding might be taking off,” she said, noting that she brought the truck to one wedding expo at a vineyard and has seen business because of it. The idea is a “very smart way to market the business,” according to marketing expert Mindy Wolfle. While some are extensions of “brick-and-mortar” restaurants, others operate solely out of the truck – an aspect that Wolfle said gives owners freedom. To operate a food truck in Huntington, vendors must acquire county health permits and a peddler’s permit from the Town clerk’s office, according to town spokesman A.J. Carter. When vendors do acquire their peddler’s permits, Kennaugh said, they also receive “a pretty hefty packet” detailing the streets on which they are not allowed to park the trucks. The restrictions have not presented a “giant obstacle,” she said. Among a few other locations, Park Avenue’s Ripe Art Gallery gave Kennaugh permission to park her truck in its gravel parking lot when she wants to, Kennaugh said. Those driving to work do not typically factor in the time to stop for a cupcake or breakfast item during their morning commutes, she said; but, she noted, if she could establish consistency in where and when the truck appeared, business might pick up.